We love the Autumn at Wedding Letter Hire. Most people can tell the changing of the seasons by a shift in the weather or the leaves colouring on the trees. However, in the industry we can tell that time is ticking by as there is a change from outdoor marquee events and pastel florals, to cosy country houses with roaring log fires and rich warm autumnal bouquets! Autumn can be a great time to get married. Venues are often less busy and can be more reasonably priced as we come out of the summer season, and if you are lucky the weather is still warm enough to allow for an outdoor reception and photos. So if you are having an Autumn wedding here are some great tips to make it a wonderful occasion. We really enjoy seeing brides embracing the seasonal colours with the golds, russets and reds of the leaves and autumn berries. Gold is a really popular colour for dresses at the moment and looks absolutely stunning. Our giant illuminated letters also look amazing against a gold backdrop! Autumn is a great time to make the most of the wonderful flowers around such as deep red roses, yellow berries and green foliage – infuse your wedding bouquet with these classic colours for a really abundant feel. As the days draw in and the nights get longer Autumn provides the perfect opportunity to add an extra element of sparkle to your big day. 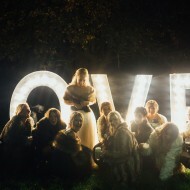 Out giant mr and mrs light up letters illuminate the night and look fabulous at an evening disco. Our LOVE letters can even go outdoors so why not greet your guests when they arrive at your reception by proclaiming your love in lights! To complement the giant letters you could give all of your guest’s sparklers or neon glow sticks to wave. You could even add a flourish to your big day with a fireworks extravaganza! Using seasonal, local food is a really big trend at the moment so give your menu an Autumnal feel. Take away the chills by providing a warm fruit punch or mulled wine at your reception as a change from champagne. Work with your caterers to plan out the perfect seasonal menu with warming spices, fresh produce and of course a comforting and traditional pudding for desert! You can really use the beauty of nature to highlight your Autumn wedding. Days can be mild so don’t feel that you have to keep your guests inside. Photos taken outside can look stunning and if you don’t want your guests to feel a chill you can always call on our sister company Rio Lounge who can provide stunning patio heaters which bring warmth and a cosy glow to your reception.